Already, some 3.4 million people die every year from water-borne ailments such as cholera, typhoid, some types of hepatitis and diarrhoeal diseases, said the United Nations Environment Programme. "Many of these diseases are due to the presence of human waste in water," it said in a statement. "The solution is not only to build more sewers but to treat wastewater." The agency estimated that 164 million people were at risk of water-borne diseases in Africa, 134 million in Asia and 25 million in Latin America. "The increasing amount of wastewater being dumped into our surface waters is deeply troubling," said UNEP chief scientist Jacqueline McGlade. "Access to quality water is essential for human health and human development. Both are at risk if we fail to stop the pollution." The rise is driven by factory waste, runoff from fertilisers and pesticides used in agriculture, as well as an increase in untreated sewage discarded into rivers and lakes, the agency said. 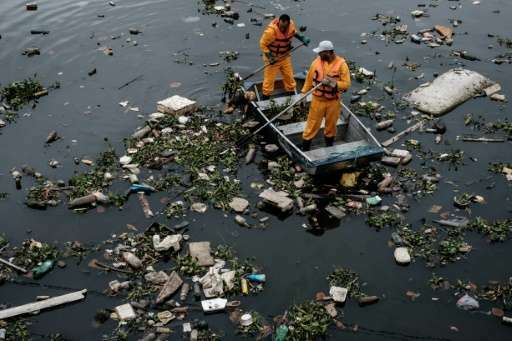 "Severe pathogen pollution... is estimated to affect around a quarter of Latin American river stretches," said the agency—up to a quarter in Africa and half in Asia. In some countries, up to 90 percent of the population relies on rivers and lakes for drinking water, said the report. Freshwater fisheries, which employ some 21 million fishermen and create some 38.5 million related jobs, are also at risk, while salinity pollution from dumped wastewater threatens irrigated crops. "There is still time to tackle water pollution," said the UNEP. Polluted water must be treated before entering rivers or lakes, wastewater recycled for irrigation, and wetlands restored to remove pollution from runoff water. "It is now time to use these tools to combat what is slowly becoming one of the greatest threats to human health and development around the world," said McGlade.